Guest speaker, Marychuy Velarde, System Validation Engineer from Intel. 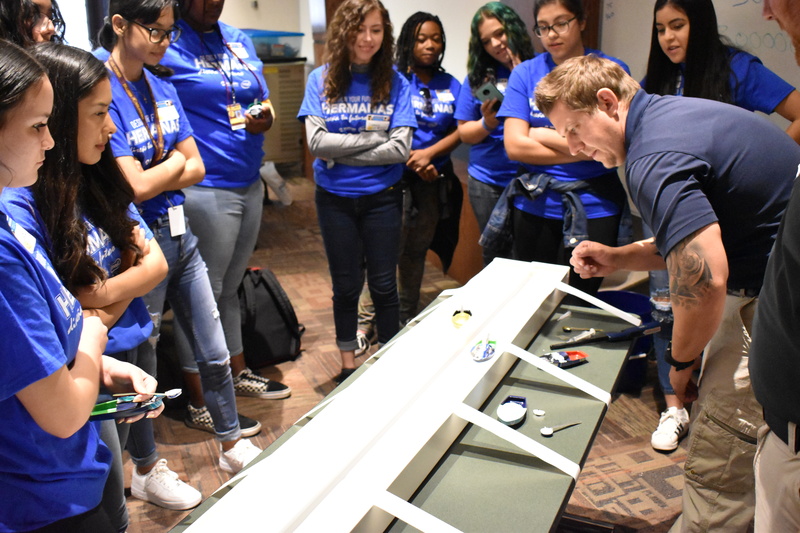 Girls from five different high schools were shown the endless possibilities that come with STEM careers March 29 at the annual Hermanas conference at Estrella Mountain Community College (EMCC). 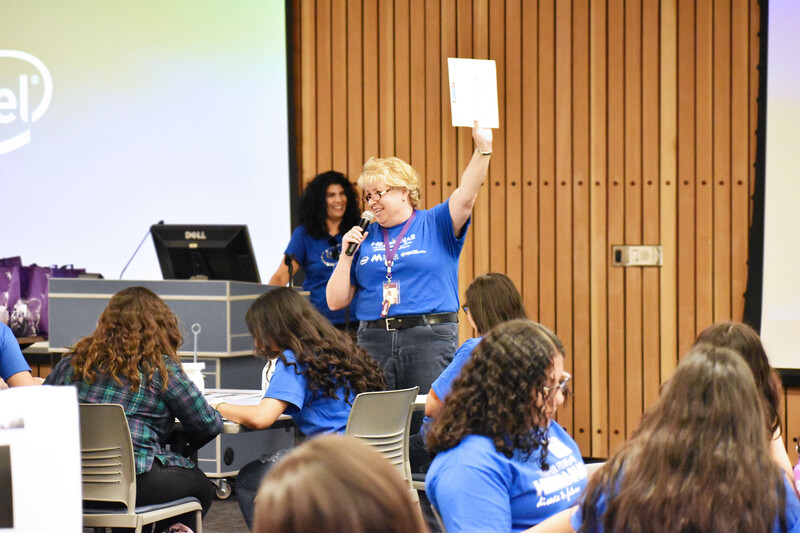 EMCC is one of several colleges within Maricopa Community Colleges to hold the conference, which is primarily sponsored by Intel and designed to expose young women to STEM (science, technology, engineering and math) fields. EMCC held its first conference in 2005 as a high school program and then added a middle school program. “The goal of the program is to expose young woman to the STEM fields with hands-on workshops that allow them to explore majors and careers in those areas,” said Laura Dulgar, Dean of Student Affairs and Chairwoman for the EMCC Hermanas Planning Committee. Dulgar gave the opening remarks at the start of the conference, acknowledging each school in attendance. When she called on the school, its students were to hoot, holler and wave their jazz hands. If they didn’t, Dulgar stayed true to her threat of calling them out (in the most good natured way, of course) until they acquiesced. By the time she introduced the guest speaker, Marychuy Velarde, the girls from Agua Fria, Tolleson Union, Desert Edge, Copper Canyon, and Tonopah Valley high schools were all smiles and ready to dive into the day. 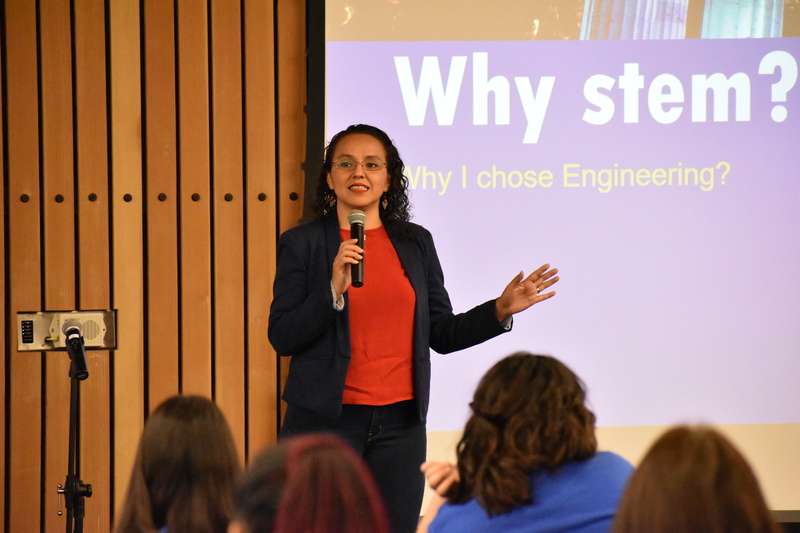 Velarde, a System Validation Engineer from Intel, shared her story about being the youngest of nine siblings in a Hispanic family and wanting a job that didn’t exactly fit with her culture. Velarde wanted to be an engineer. “I wanted to figure out how things worked, solve problems, and make things better for those around me,” she said. She stressed the importance of getting a college degree, whether in STEM or another field, and said after she got hers, her nieces and nephews followed in her footsteps. “I was an agent of change in my family,” Velarde said. After the welcome address, the girls broke off into two groups and attended hands-on workshops titled “Steam Boat” and “Let’s Play with Robots” before lunch and an education fair. Afterward, each group attended a Latina Town Hall. 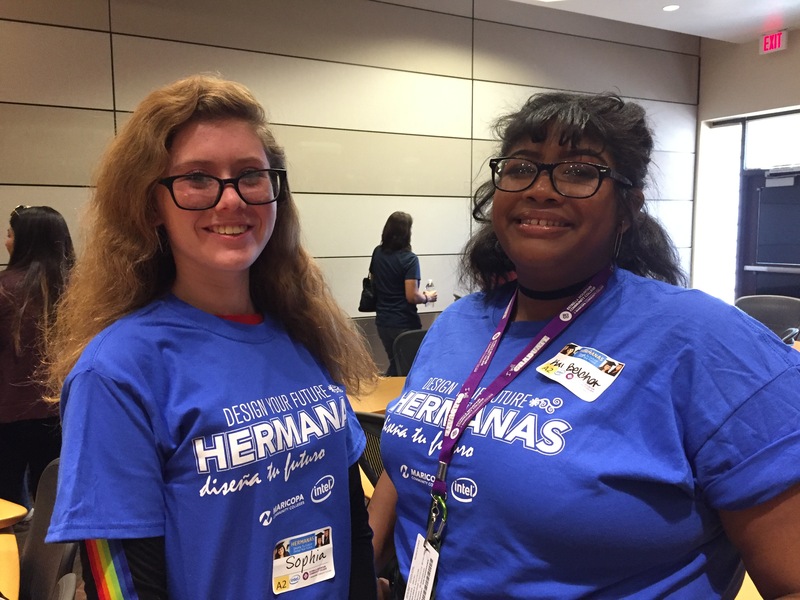 The Latina Town Hall was the favorite part of the conference for many students, including Sophia Mitchell and Kai Bradley-Belcher, both juniors at Copper Canyon. “By far, my favorite part was the Latina Town Hall, because I found the discussion to be very interesting and helpful, as it gave me a new perspective on college and what may be right for me,” Sophia said. The 16-year-old plans on attending community college after graduating from high school. “I want to get a feel for what to expect in the future, because later along the way, I plan to get into a university where I want to strive for a master’s degree,” she said. She said she’s not entirely sure what she may study, but can see herself getting into the STEM program. “I’ve always loved science, especially technology, so I’ve been curious what these paths could have in store for me if I give them a try,” she said. Kai said she favored the Latina Town Hall because she and her classmates had the chance to speak with women about their life experiences. “It felt super personal and I really enjoyed that,” she said. Kai plans on attending EMCC after she graduates. As an ACE (Achieving a College Education) student, the 16-year-old is already familiar with EMCC. ACE students enroll in college courses while attending high school to experience and acclimate to a college environment in a real-time setting. They attend on scholarships that cover tuition, registration fees, and course fees. Kai has been attending EMCC through the ACE program for a little more than a year and will have 24 college credits when she graduates from high school. After the Town Hall, the girls attended a session called “how to Prepare for College” and then a wrap up where lots of EMCC and Intel swag, including a tablet, was raffled off. Sharon Lind, Administrative Specialist Senior, said the conference is beneficial to young women who may not know what opportunities are available in technology, or what it takes to be an engineer, scientist, or a technical professional.